Nobody puts Lady in the corner. I’m a firm believer that the 1950s were the most important decade in the history of Disney. Sure, I see the billions of dollars made by their Star Wars and Marvel movies, but if they hadn’t been able to expand their brand in the 1950s past animated entertainment, they might not still be here today. The earlier part of the fifties had seen the company dipping their toes into live action entertainment with hits like Treasure Island and 20,000 Leagues Under the Sea with fantastic results. In late 1954, Disney launched a nighttime anthology series called Disneyland that brought Disney out of the theater and into the homes of millions. However, no company has ever owned a single year like Disney owned 1955: in that one year, Walt’s theme park Disneyland opened, The Mickey Mouse Club debuted on ABC, bringing new programming to kids five days a week, and Disney had a legitimate sensation on their hands with the first of two Davey Crockett films, Davy Crockett, King of the Wild Frontier. You ever see pictures of kids from the fifties wearing coonskin caps? That was because of Disney and their show starring Fess Parker; they took footage from the Davy Crockett TV mini-series and cut it together into theatrical films, which were huge. HUGE! At the peak of the Davy Crockett fad, Disney’s merchandisers were selling 5,000 coonskin caps a day. I have 27! These accomplishments wouldn’t have meant nearly as much if Disney hadn’t also managed to retain their crown as the king of animated cinema, and they delivered one of their most beautifully-animated classics in 1955 with the smash hit Lady and the Tramp. Disney’s fifteenth animated film represents a culmination of the studio’s massive breakthrough in the 1950s. During the previous decade, the company had been on the ropes during and after World War II, with the studio struggling to survive and nearly going under. The 1950s was the first renaissance of Disney and saw not only a return to form, but some of the best movies they’d ever made. Five Disney animated classics were created in the fifties: Cinderella, Alice in Wonderland, Peter Pan, Lady and the Tramp, and Sleeping Beauty. 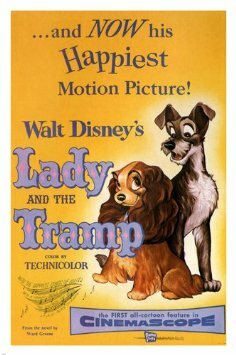 Though Sleeping Beauty hit screens in 1959, I believe that Lady and the Tramp is actually the final Disney animated film to retain Walt’s style. It marks the end of an era. Let me explain. Sleeping Beauty looks like no Disney film before or after it. It was a marked departure for the studio, with greater emphasis being placed on the backgrounds and a distinct medieval influence evident in every frame. Even most of the character designs in Sleeping Beauty are very different from the exaggerated caricatures that was a hallmark of Walt’s style. Sleeping Beauty was also so ambitious that it was ahead of its time and ended up losing so much money that it almost shut down Disney animation. To add even further context, after the failure of Sleeping Beauty, Disney entered the Xerox era of animation, which is exactly what it sounds like: machine-aided copying that saved animators hundreds, if not thousands, of man hours. The sacrifice was in quality, with a new, scratchy style that became a trademark of Disney for the next two decades. No Disney animated movie from the sixties or the seventies has the hand-crafted smoothness associated with the hand-drawn animation of the fifties. Even when the studio returned to their traditional style in the eighties, it was never the same again. Lady and the Tramp was literally the last Disney movie of its kind. It’s breathtakingly beautiful. Where does one even start with this movie? Chances are you know it well, as it has been one of Disney’s most beloved and profitable classics. It’s a traditional story of love from the wrong side of the tracks, the same kind of story that Hollywood has been telling since day one. Lady is an upper-lass dog of pedigree and lives in a wealthy home. Tramp is a free spirited stray who never knows where his next meal will come from, but loves the vagabond lifestyle. 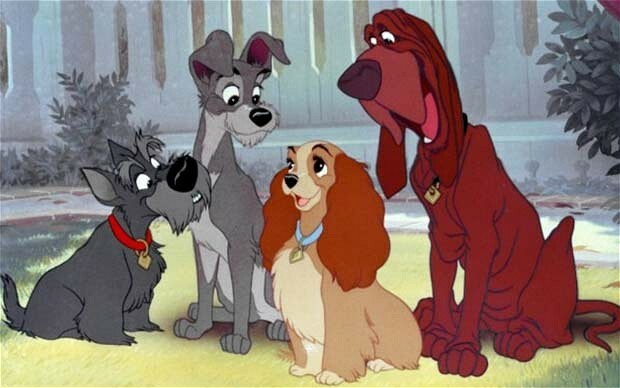 As Paula Abdul knows so well, opposites attract, and Lady and Tramp are drawn to each other for obvious reasons. With a rich cast of supporting characters that lend themselves to affordably-priced plush toys, Lady and the Tramp is a perennial favorite among children of all ages. Interestingly, the only real star in the voice cast is Peggy Lee, which the film uses to maximum effect. This means that Lady and the Tramp mostly earned its status without stunt casting the hottest actors in Hollywood at the time. Audiences agreed, and it was the sixth-highest-grossing film of 1955. Unfortunately, Lady and the Tramp gets just as much bad press as praise these days because of its racially-charged portrayal of two Siamese cats, Si and Am. It’s hard to separate the movie from those two cats because they play such a key part in the story, and the song they sing is impossible to get out of your head. As far as I know, Disney hasn’t really backed down (i.e. apologized or hidden) the portrayal of these cats, which you can interpret yourself. I don’t really feel like I can speak about this movie without addressing the controversy, so I will say that I do disapprove of the characterization, but that I’m glad Disney hasn’t buried this movie or cut all the incriminating footage from its runtime like they have with some of their other cartoons. Furthermore, context is important, and this movie was made in a post-World-War-II America when Japan had bombed Pearl Harbor and Thailand (Siam) had united with Japan to declare war on the US and England. Many of the animators and creators who worked on this film had served during the conflict and lost loved ones to the Axis powers. It’s complicated, but it’s also not right. 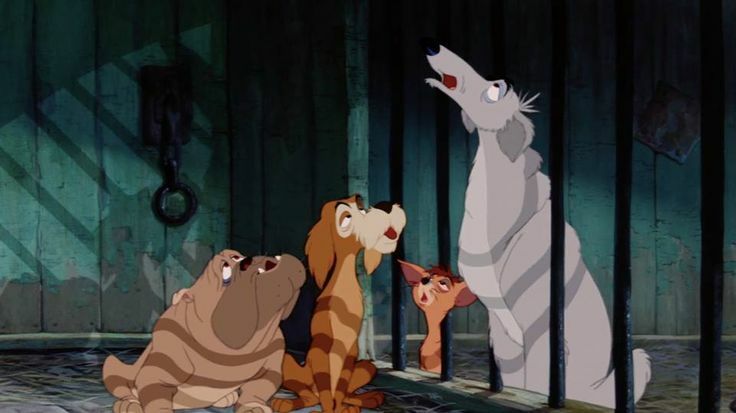 History can’t be whitewashed, but it can be learned from, and the Siamese cats of Lady and the Tramp stand as a record of who we were in 1955, for better or for worse. When we see where we’ve come from, we can hopefully do better moving forward. Sometimes I think that I don’t really like Lady and the Tramp all that much. Though it’s been on my movie shelf from the VHS days to Blu-ray, it’s never a movie I reach for when I need a dose of that Disney magic. Yet, every time I do end up watching it, I’m always impressed by the lush animation--the best of this era--and the ability this movie has to move from scene to scene. Some Disney movies (they know who they are) get bogged down in certain segments and can be a chore to get through, but Lady and the Tramp MOVES, baby. Even the sentimentality of this film doesn’t feel as forced as it does sometimes. Disney, more than just about any other animation house, is guilty of playing the heartstrings too much in order to manipulate their audience. They have never been above a gut punch to bring you to tears, and if they can do it two or three times in the same movie, they will. I feel like Lady and the Tramp holds back on this and shows moderation. The only sad death that we witness along the way is a character that we don’t even know (I’m not counting the rat), although they do pull a cheap bait and switch near the end. You’ve never been so relieved to see “The End” pop up without a major character death (“Another child cries as another puppy dies in the ghetto”). Then there’s THAT scene in Lady and the Tramp, one of the most classic in all of Disney’s canon. 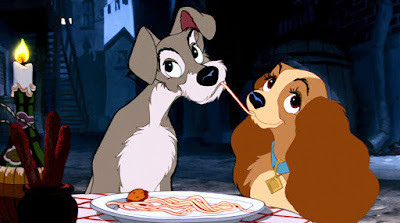 Of course, I’m talking about the romantic segment where Lady and Tramp share a plate of spaghetti outside Tony’s Restaurant while they’re serenaded with “Bella Notte.” The scene is legendary. The song is unforgettable. Even if the rest of the movie didn’t work (it does, Siamese cats excluded), this one scene makes it worth your time. This one moment of film sums up the entire story: we understand what Lady sees in Tramp, why Tramp is drawn to Lady, and how much they care about each other. You forget you’re watching CARTOON DOGS and just go with the beauty of storytelling at its best. Bonus tip: next time you’re at The Magic Kingdom in Walt Disney World, look on the ground outside Tony’s Restaurant on the right side Main Street. There’s a Lady and the Tramp Easter egg from this scene that thousands of people walk right by every single day without noticing. There’s a reason that Lady and the Tramp is an enduring classic: it’s a timeless story of a rebellious guy who meets a girl way out of his league that he can’t stop thinking about. It’s romantic and fun, sweet and breezy. It’s also the absolute pinnacle of the style of animation that Walt himself established in 1937 with Snow White and the Seven Dwarfs, with no hand-drawn animation coming afterward ever looking quite as lush and smooth as this. It may not be my favorite Disney animated movie, but it’s a very important piece of history for Disneyphiles and animation fans. Lady and the Tramp is further evidence that 1955 was a VERY special year for movies. I loooove this movie, in no small part because I've been a dog person all my life. I always figured that if Si and Am stereotyped anything, it was cats. You know, that cats are deceitful, duplicitous creatures. Perhaps it's poetic justice that Mulan (taking place of course in China) depicted Mulan's dog as a salivating moron. Even so, "little brother" retains the dog's secret weapon of being adorable. I have a similar issue to the Si and Am characterisations in Lady and the Tramp with the crows' appearance in Dumbo. It's just as culturally insensitive by moderns standards, but goddamn "When I See an Elephant Fly" is a great, catchy song. The America of this period was by degrees both consciously and unconsciously racist; and Walt Disney himself was supposedly pretty intolerant when it came to certain groups of people. I adore the music of Richard Wagner — if you have a child you would like to see grow up to be cultured, introduce it to What's Opera, Doc?, the Chuck Jones Bugs Bunny classic from 1957 — and he was virulently anti-Semitic as well. William Shakespeare doesn't get a pass, either. I guess it comes down to whether we are obliged to condemn racist characterisations (or the racist views of long-dead composers and writers) from old movies and refrain from watching them out of a sense of liberal guilt, or if we can enjoy them for what they are: cultural artefacts from a different age. It's complicated by the fact that many of the stereotypes on display in movies like Lady and the Tramp, Dumbo or The Jungle Book (King Louie's desire to "be like you") haven't gone away but are still in force today. Those of African origin (we're all of African origin, but that doesn't matter to bigots) can expect to receive images of apes and monkeys in their social media feeds; and even the much more recent Aladdin gives mainstream vindication to those who think Islamic societies are innately violent with the merchant's song — ♫Where they cut off your ear if they don't like your face / It's barbaric but, hey, it's home♫ — not to mention the depiction of hook-nosed, dark-skinned villains in contrast to the much more westernised hero characters. Can I watch Song of the South if I give a donation to the ACLU or resolve to turn up to show support at a Black Lives Matter march? Am I being overly precious or patronising if I do? It's a dilly of a quagmire of a pickle. The controversy over Moana really bugs me because Disney had an entire panel of Pacific Island scholars and leaders who gave them notes all along the way. I honestly don't see how they could have tried harder. The documentary on the Blu-ray and DVD about representing the Pacific heritage is one of the most beautiful, culturally-embracing pieces of film I can recall. Not that I'm comparing the Siamese cats in this movie to Moana, because...no. Lady and the Tramp was a movie staple growing up. I had always loved it, but never really thought about why. Your observations are spot on! The story, the animation are all stellar and of that old Disney feel. In terms of Si and Am, it wasn't until revisiting it when I was older did I realise that it was an offensive caricature! In my blissful ignorance (or innocence), my sister and I thought it hilarious - and we are first-generation Australians of Asian extraction. Look, I'm saying I was a 'lil tyke probably singing this song aloud in public inadvertently causing many a people to squirm back in the day. I reckon there is comedy to be found in celebrating differences between us, but this can't really happen unless genuine acceptance and social cohesion is forged. Far too often, these differences are used as a weapon or divisive agent in society. (Again, unfortunately formative experiences growing up taught me this). You put it most beautifully Heath, When we see where we’ve come from, we can hopefully do better moving forward. I think with all of these matters, talking, listening, empathising, and always striving for a mutual understanding is the better way to go as opposed to smoothing over, avoiding or short-circuiting the conversation. Anyways, great column Heath! Love your work. Thank you so much for the kind words, Gil! And I'm sure I sang the Siamese cat song a bunch as a kid too. I may have sang it while working on this column, but no one can ever prove it.